Amandla! : Can you briefly tell us about Abahlali – its constituency, its structures and the issues that it has mobilised those around. Thapelo Mohapi: Abahlali is a grassroots democratic social movement that was formed in 2005, in Kennedy Road, by shack dwellers themselves. It was formed out of frustration, it was formed out of anger, it was formed out of poverty. It was formed by people who were poor and people who said “enough is enough”. Because there was land promised by the ANC-led government in Kwa-Zulu Natal. Especially, the City of Durban promised to build houses for them. People later uncovered that the land was actually sold to a business person. And then they saw this factory that was making bricks on their land that they were promised. So people then decided to take to the street, and they blockaded the N2. Twelve people were arrested as a result of so-called illegal protest – the “Kennedy Twelve”. 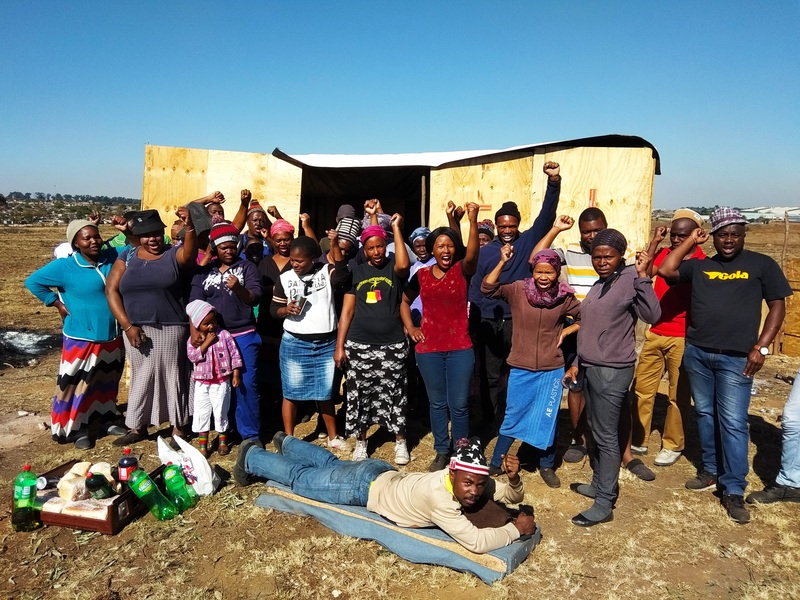 We named it Abahlali baseMjondolo, which means the Shack Dwellers Movement. The movement to date has 55 000 membership across five provinces – Mpumalanga, Eastern Cape, KwaZulu-Natal, Western Cape and Gauteng. We have six branches in Gauteng, three in Mpumalanga, two in the Eastern Cape in Bizana and of course we have about 40 branches in KwaZulu-Natal. This weekend we launched a new branch which was named after Sifiso Ngcobo who was assassinated earlier this year by unknown men in his house. He was the chairperson of eKukhanyeni branch. In a Branch, we have the Local Council who are elected by the community in that area. Then there is a Provincial Council and a National Council. We also have what is called the Chairpersons’ Forum where the Chairperson from each Branch in a Province can convene a meeting and discuss issues that are taking place in their branches. The Local Council holds a meeting once a week and there is a meeting of the community, convened by the local structure once a month. We also have what is called a General Assembly, where all branches in a region convene and speak about their problems. So there’s this constant process of meeting and communication in Abahlali baseMjondolo. A! : What are the key current activities and the type of struggles that Abahlali is currently mobilizing around? And where does the movement see itself going in the next couple of years? TM: Well the movement at this point in time is advocating against the illegal evictions that are taking place within the city of Durban in particular. Of course, there are new occupations that are taking place in Mpumalanga and in Johannesburg, in Germiston in particular – where there there’s a new occupation called Zikode Extension. And there are about eight occupations that are taking place in Durban– our new branches were launched there. But basically, the movement advocates against illegal evictions and we are also advocating for the right to the city. That city’s Black people have for a while been denied the right to be in the city. And we have now more than 39 settlements that are close to the city of Durban. But it has come at a heavy price. People were killed during these occupations, in Cato Crest, Cato Manor, Briardene and other places. We advocate for the rights of people to be closer to the places where they work, so they can be closer to the economic boom where the concentration of the economy is, which Black people have been denied. A! 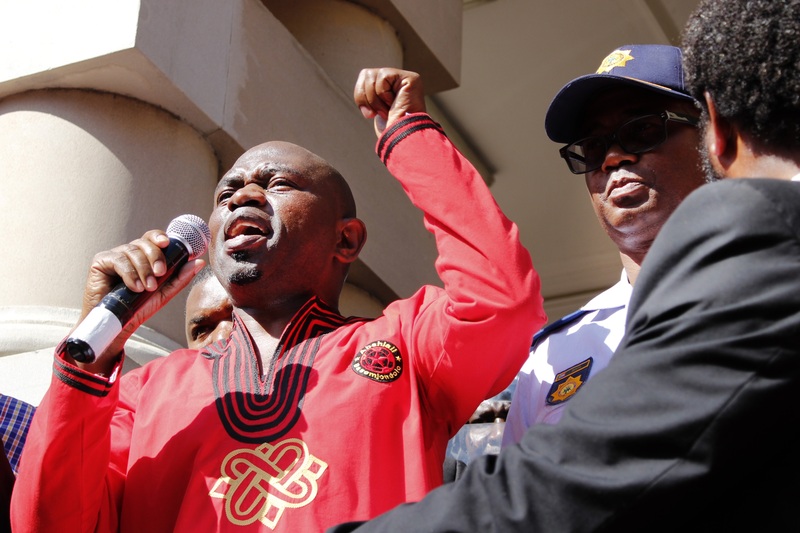 : Where does Abahlali see itself going? TM: The movement wants to create a space outside of politics. The government is still busy providing electricity and water to the middle class and the elite. We are actually an alternative – a non-political, non-electoral way of providing services to the people. And people realise that they are the only ones who can actually take responsibility of providing services, because the ANC has clearly failed to actually deliver services for them. So in future, we are anticipating that more and more people will see that the ANC is not doing anything for them. The only alternative is for people to actually occupy well-located land in the city and connect into services such as electricity and water and try to build their own communities. But it’s not an easy thing to do in KwaZulu-Natal because whenever you are organizing outside of the ANC, you are seen as a threat, you are referred to as a third force. And that’s why we are being killed today – because we are actually awakening people and making them see what the ANC is and that the ANC will never deliver anything for them. A! : So what do you think has allowed Abahlali to survive? TM: In the past 13 years, the ANC has tried by all means to suppress the movement. In fact, in 2009, when the movement was attacked in Kennedy Road, the now premier of Kwa-Zulu Natal went into Kennedy road and celebrated that Abahlali had been destroyed. The repression by the ANC is how the movement grows. But more than anything else, I think it is the power of the masses from below. Brave young and old women and men who actually faced a barrel of a gun. I think it’s the bravery of the leadership, especially S’bu Zikode, who by the way is going into hiding for the second time. The power that we have is given by the people that we lead. In fact, they are the ones who lead the movement and the movement has always been owned by the people. People feel ownership of the movement, rather than the leadership being the one who dictates for the people. It is the people on the ground who make decisions, who own the movement, who say which direction the movement must take. So for example the people just decided recently that the entire leadership of Abahlali baseMjondolo must be dissolved. And we had no rights because they are the owners of the movement, they the people on the ground are the people who count more in the movement. And I think that’s what has made the movement to sustain itself over the years, that democratic process from below that the people are the ones who can speak and take decisions of the movement. A! : So you don’t think that other social movements have been democratic enough? Would you go so far as to say that? TM: Sometimes what destroys movements is the money that is put in by donors. And people start fighting over how much goes to who and so on. With us it has never come to that. We never looked at money as an issue. In fact when the movement was formed, it was formed without money. Some social movements have been formed with donors being there in the first place. With us, donors came after. So if donors were to leave now from Abahlali baseMjondolo the movement will still exist, because it existed prior to them coming into the movement. A! : You have spoken a bit about leaders that have been killed since 2009. Why do you think it is that Abahlali is being targeted and who do you think is targeting Abahlali? TM: Abahlali have been killed by the ANC in Kwa-Zulu Natal. We have two ward counsellors who have been sentenced to life imprisonment who killed Thuli Ndlovu in KwaNdengezi in 2014. Nkululeko Gwala when he was killed, he was warned by the then mayor of eThekweni Municipality James Khumalo that he must stop what he is doing otherwise his parents must prepare for his funeral. So we have prominent ANC leaders from provincial and even at local eThekweni Municipality who are involved in the killings. And that’s why the police have not uncovered those. When you are seen as somebody who is creating their own authority, you are seen as an enemy, you are therefore targeted. On 12th June this year, the Mayor called us a Third Force and said that we are hellbent on making the city ungovernable and that they, as the ANC, wanted to deal with Abahlali. Those are direct threats, those are open threats. And I think they are threatened by the fact that we expose corruption, wherever we see corruption. They are threatened by the fact that we put a face on the corrupt. We are going to mention whenever there’s corruption and we are going to expose and put a name in the corruption that’s taking place.